As fighting in the Middle East continues, civilian vehicles crudely retrofitted with mounted guns have become a trademark of militia warfare. Consisting predominantly of jerry-rigged Toyota pickup trucks, these vehicles are referred as "technicals" in military jargon. Libyans, however, have a particular habit of crafting vehicles that stand out among their counterparts. It was Libyans who came up with the idea of rigging unguided rocket pods, initially designed for mounting on aircraft, onto their technicals. This time, a US-made Humvee has been spotted in Libya, sporting menacing 90-millimeter cannon, cannibalized from some other armored car. — Task & Purpose (@TaskandPurpose) 10 апреля 2019 г. ​According to Business Insider, the cannon could have been ripped from a French Panhard AML-90 armored car. If that's the case, then the turret should be able to propel D921 90-millimeter explosive shells to distances up to 1,500 meters. 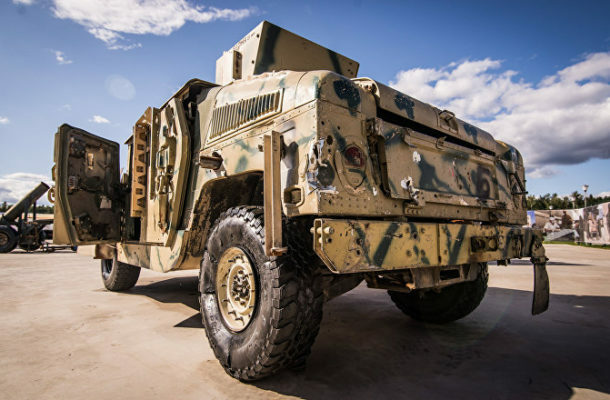 It is unclear whether Humvee's trademark wide frame is enough keep the vehicle from flipping when the gun is shot sideways or whether the entire contraption will survive even a single shot. It is also unclear whether the vehicle, custom-built upon a military truck rather than a civilian vehicle, counts as a technical. Reuters suggests the cannon-armed technical belongs to a militia from the western city of Misrata, allied with Libyan Prime Minister Fayez al-Sarraj. The militias, along with Tripoli's forces, are fighting against Libyan National Army leader General Khalifa Haftar, who previously served in the military under former Libyan leader Muammar Gaddafi. On 4 April, Haftar initiated a military escalation, with the goal of taking Tripoli from the UN-backed government. — Arms & Armament (@ArmamentReview) 30 января 2017 г.